Register before 15 Mar 2019 for only RM3,500 per person. Register before 31 May 2019 for only RM3,500 per person. Register before 22 Aug 2019 for only RM3,500 per person. 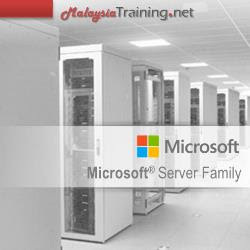 This 4-day Administering Windows Server 2012 training course (20411D) is an official Microsoft course designed for IT professionals who work in the Windows Server 2012 environment as well as for those who want to take the Microsoft Certified Solutions Associate (MCSA) exam 411: Administering Windows Server 2012, which is the second of three exams required for MCSA: Windows Server 2012 credential. Before attending this course, students must have Knowledge and skills concerning the initial implementation and configuration of core Windows Server services including Active Directory Domain Services (AD DS), Networking Services and Microsoft Hyper-V.